Little black boy’s Mohawk haircuts are the best ones as there is so much room for improvisation in them. You can add your personal touch to these stylish haircuts by playing with fringes, types of fading, curls, and parts. The freedom of adding a design to your kid’s hairstyle makes them even cooler. Your little gentleman will surely fall in love with Mohawk haircuts if you get him one perfect for his personality. Mohawk hairstyles are the coolest ones of all hairstyles for little black boys. Because they are stylish and unique as well as are easy to maintain. Running around or gentle winds do not send Mohawk hair going messy or sloppy. This is why they are perfect for little boys. As they know that, they cannot let their hair come in the way of fun! If you are planning a visit to the barber’s for your boy, have a look at these little black boy Mohawk haircuts. So that you can get a basic idea of what you and your kid want. This is the perfect Mohawk hairstyle for black little boys with curly hair as it neatly puts everything in its place. The high skin fade makes them look polished and well-groomed for any event. The curls are cut short too so that they can be arranged easily with some gel. The side part that goes with it enhances the details of the haircut overall, making it look even better. This hairstyle is the perfect combination of messy and refined. The low drop fade makes the hair look well cut and managed. Whereas the short Alfro twists on the top, give it a wild funky look. 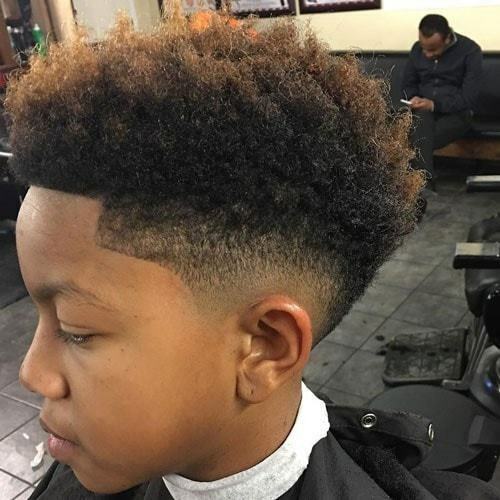 This Mohawk haircut for little black boys is cool and your boy will love sporting it. This is probably the coolest Mohawk haircuts with all the locks on top standing upright. You can set them and make sure that they stay in their place by applying a lot of gel or paste. The fade at the sides gives a dramatic feel to this cool haircut which gets perfect with a stylish lineup. This absolutely cool, outgoing and very bold hairstyle leaves your kid looking great. This will boost up his confidence and personal charm many times. The hair stays long and you do not have to get them cut from any side except the sides for fading. This is the secret to the success of this black kids Mohawk hairstyle! You can set the locks in any direction that you and your boy likes with the help of a gel which is okay for kids. So, you should try these cool little black boy’s Mohawk haircuts to make your boy feel and look great. Wow! Great, alot of stuff, its amazing keep it up, DUDE.